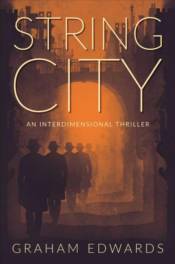 In an inter-dimensional city full of gods, living concepts and weirder things, a gumshoe � a �stringwalker,� who can travel between realities � is hired to investigate an explosion at a casino. He ends up on a frantic chase to track down and retrieve an unimaginable power source, while staying one step ahead of the ancient Greek Titans, an interdimensional spider god and the mysterious creature known as the Fool. If he fails, all things � in all realities � could be destroyed.